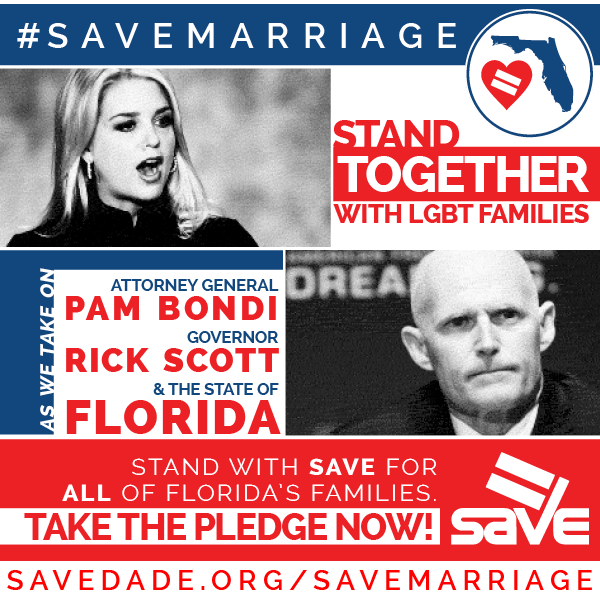 Tell Attorney General Pam Bondi and Governor Rick Scott to drop their defense of Florida's antigay marriage equality ban and to stop the attacks on LGBT Floridians! Enough is enough…..please stop your discrimination against LGBT. WE WILL NOT SIT BACK AND LET OUR STATE BE THE SCAPEGOAT FOR THESE HOMOPHOBIC CROOKS, RICK SCOTT AND PAM BONDI!! THEY HAVE NO RIGHT TO STAND IN THE WAY OF OUR CONSTITUTIONAL AND CIVIL RIGHTS. WE MUST VOTE THEM OUT OF OFFICE NEXT MONTH!!! As a libertarian I am appalled that Florida, my state, refuses to leave people alone in their bedrooms and in their choice of a mate.